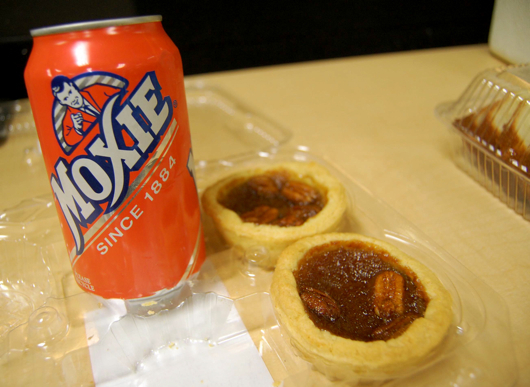 One can of Moxie, Maine's official soft drink that represents the North, bravely takes on two pecan tarts, fighting for the South. Though outnumbered, the Moxie won this civil war. The primaries are over. Copy editors everywhere are rejoicing: The less late-breaking news, the better. But the close of the season has reminded me of how it all started in Florida. It was primary day back in January, and there was plenty of food flowing in the newsroom at FLORIDA TODAY. My contribution was a few cans of Moxie. A friend of mine had sent a case of it down from Maine, where the age-old soft drink and the state's official soda is quite common. Down here in Florida, it can't be found. Because of its rarity, I didn't want to share all of it with my co-workers, but I at least wanted them to taste what it's like to be a real Mainer. And most people who try Moxie just can't handle the cola's bitter, dandelion-like aftertaste. That's why most people don't have what it takes to be Mainers. I told my co-workers to take sips, not gulps. I wouldn't be offended if they spit it out. Most people didn't care for it. But my boss was quite enamored. Why? He's from New Hampshire. He isn't a Mainer, but he's close enough: New Englanders are more apt to hold their Moxie than my other, more Southern co-workers. Another co-worker supplied the eats: pecan tarts. Then, my boss keenly pointed out the symbolism: It was civil war. There, sitting side by side, was a can of Moxie and a few pecan tarts: The best of the North meets the best of the South. But when the crumbs and fizz settled, the Moxie won out. The pecan tarts were so good that people gobbled them up. The Moxie wasn't as popular, so it was the last refreshment standing. The fact that there were no pecan tarts remaining shows how much better they were than the Moxie. They're delicate, scrumptous things, much like the South itself, whereas the Moxie was bitter and hard, like so many Yankees. And Northerners. I must not be a true Mainer then, because Moxie is awful. I can't even imagine how much it would cost to send that down here.